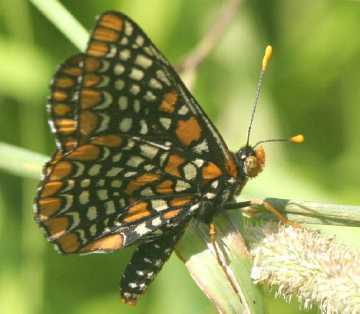 The Baltimore checkerspot butterfly lays its eggs on turtlehead plants. The young leaves are food for the early-stage caterpillars. At later stages, the caterpillars often move to different plants. These butterflies are medium-sized – about 2-1/2 inches – and most likely to be seen in July. Native turtlehead plants that grow in damp places in Westborough bring us fall blossoms, old-fashioned fun, and a summer butterfly. In early September, turtlehead (Chelone glabra) blossoms open on spikes on the 2- to 4-foot plants. For most of the summer, the plants themselves are hard to spot among other greenery, but at this time of year the gleaming white flowers may catch your eye at the edges of streams, ponds, and swamps. If you look at the blossoms for a while, you may be in for a surprising sight, especially if there are bees around. The blossoms may move, as if they are chewing something. The reason for the chewing soon becomes clear - there's a big bumblebee inside, bumping around as it gathers nectar and gets covered with pollen. The sight of chewing turtleheads can be entertaining, especially for kids. Kids can also squeeze the sides of the flowers to make the turtleheads "talk". Talking turtleheads have probably entertained playful folks of all ages through the centuries. You might also spot a ruby-throated hummingbird (Archilochus colubris) at turtlehead blossoms. Accordingly, an old name for the plant is hummingbird tree. Hummingbirds come for nectar and help to pollinate the plants in the process. It takes a large pollinator to reach the nectar deep inside the long blossoms. Clusters of large blossoms resemble turtles' heads. Turtlehead blooms along the edges of streams, ponds, and swamps at this time of year. The native turtlehead in our area has white blossoms that are sometimes tinged with pink, like these. At this time of year, hummingbirds also visit other wildflowers of wet areas in town, such as cardinal flower (Lobelia cardinalis) and orange jewelweed (Impatiens capensis). People who fish or travel by canoe or kayak often get to see turtlehead at the water's edge, but you might also spot it as you walk trails that skirt streams, ponds, or other wet areas. Try the Malley Trail at the Headwaters Conservation Area, the wooded trail along the stream near the Bowman Street Conservation Area parking lot, or the trail that leads from Mass Fish and Wildlife to Lake Chauncy. The plants are perennials so they appear in the same places every year, although flooding in this past year may have swept away some well-established plants. Like so many native plants, turtlehead has had its share of medicinal uses in the past. In folk medicine the plant is known as balmony. It hasn't really served as food, perhaps partly because it has a bitter taste. Some Native American groups made a tea from turtlehead for a laxative and to treat worms. It has also been used as a contraceptive. A common use in folk medicine involved making an ointment from the leaves to relieve skin irritations and ulcers. Turtlehead plants may not be tasty to us, but they're food for caterpillars of the Baltimore checkerspot butterfly (Euphydryas phaeton). These colorful, medium-sized butterflies appear in May to July, so you probably won't see them at this time of year. Watch for them early next summer, especially near turtlehead plants that you may find at this time of year. Baltimores tend to lay their red-colored eggs on turtlehead plants, and the caterpillars hatch after a couple of weeks to feed on young turtlehead leaves during the summer. When winter comes, the partly grown caterpillars spend it together inside silky nests that they make on the plants. In the spring, the caterpillars leave their nests and usually move to different plants to feed before transforming into butterflies. Plantain (Plantago lanceolata), white ash (Fraxinus americana), and viburnums (Viburnum species) are common food plants for late-stage caterpillars of Baltimores. People who enjoy gardening with native plants find that turtlehead can be attractive in their gardens, especially if their yard has a damp area where the soil doesn't usually dry out. The tall plants do well in sunny or partly shaded places. Because the plants are food for the caterpillars of Baltimore butterflies, they can have a place in a butterfly garden if it has damp soil. 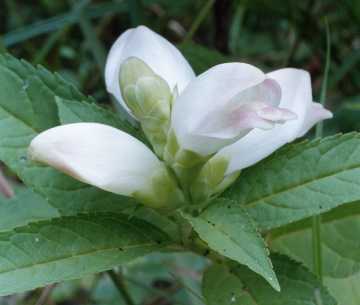 White turtlehead, as well as the pink turtlehead (Chelone lyonii) that grows in Southern states, is often available from nurseries or catalogues that sell native plants or seeds.